Blocks are coming along great! 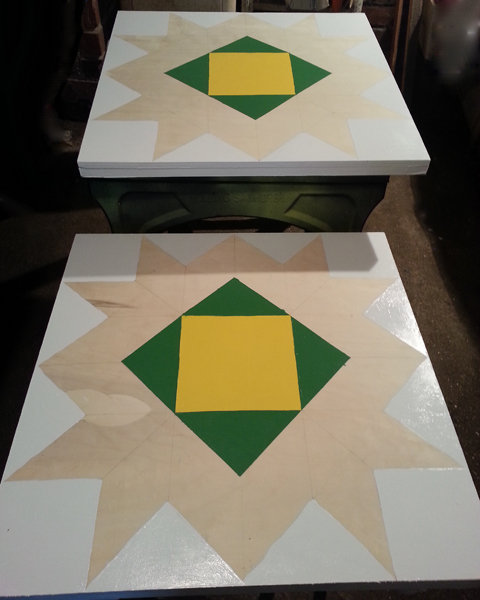 Two more coats of green then I will start on blue. I can hardly wait to see the finished blocks! These are 2 foot square blocks. I also make 4 foot and 8 foot blocks. I am working on two wooden quilt blocks that are the same. One is going to WI and the other one is going to MN. This quilt block is called Summer Wreath. 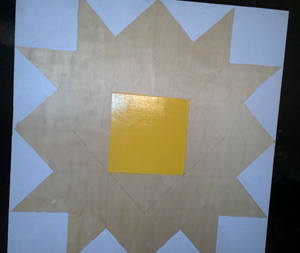 It was a very hard one to calculate all the angles but it is coming along really good now. It will be beautiful when it is done. I have three more coats of white before I start the next color. 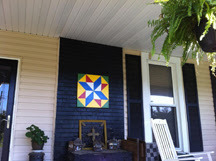 This is a photo of the wooden barn quilt sent to Union City, TN. It looks wonderful hanging there on the porch. Thanks for the photo! I enjoy seeing where my barn quilt blocks are hanging. This photo makes me want to set on the porch and drink ice tea and reminisce.